Highball cocktail recipes are served in a tall glass over ice. This grapefruit tequila highball cocktail combines the refreshing tang of grapefruit and lime with PatronTequila for a great taste. 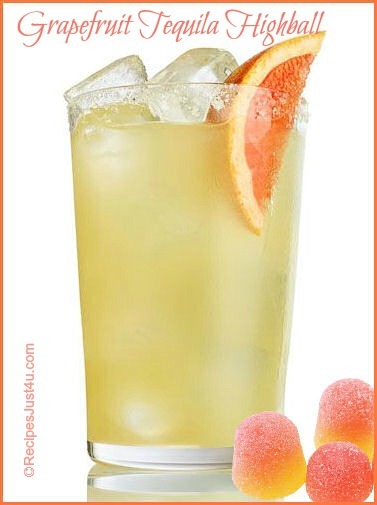 The grapefruit juice gives the drink a tangy flavor that goes nicely with the tequila. Salting the rim of the glass gives the feel of a classic margarita. Calorie wise, this won’t break the bank either, at about 150 calories each! For another great tasting Patron drink, try this Patron Pineapple Cocktail. It is fruity and tart and really easy to make. And for more fun cocktails, visit my Cocktail Hour Board on Pinterest. This grapefruit tequila highball cocktail combines the refreshing tang of grapefruit and lime with PatronTequila for a great taste. Salt the rim of a highball glass. Add one shot of Patron tequila and top up with Grapefruit juice. Finish with a squeeze of lime and serve over crushed ice.